+2 Dexterity, +2 Intelligence, -2 Wisdom: Gnomes are small and skilled with their hands and extremely intelligent. However, they often put their quest for knowledge ahead of any consequences. Small: Tinker gnomes are Small creatures and gain a +1 size bonus to their AC, a +1 size bonus on attack rolls, a -1 penalty to their Combat Maneuver Bonus and Combat Maneuver Defense, and a +4 size bonus on Stealth checks. +2 Dexterity, +2 Intelligence, -2 Charisma: Mad gnomes are just as bright and nimble as tinkers, but are driven by a single-mindedness that makes them very difficult to get along with. Master Tinker: Mad gnomes gain a +1 racial bonus on Disable Device and Knowledge (engineering) skill checks. They are treated as proficient with any weapon they have personally crafted. +2 Constitution, +2 Intelligence, -2 Charisma: Wild gnomes are hardy and intelligence, however, their tendency to treat others as case studies makes them less socially gifted. Healthy: Wild gnomes gain a +4 bonus on Fortitude saves against disease and poison, including magical diseases. +2 to One Ability Score: Half-gnome characters get a +2 bonus to one ability score of their choice at creation to represent their varied nature. Single-Minded: Half-gnomes gain a +2 racial bonus to any one skill chosen at 1st level. This skill is always considered a class skill for the half-gnome. However, he must keep his skill ranks in this skill maxed out at all times or incur a -2 penalty to all other skill checks. 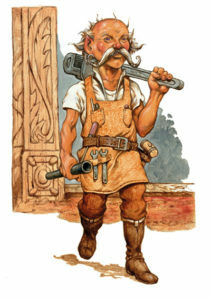 A half-gnome with this racial ability does not have the Jack-of-All-Trades racial ability. Jack-of-All-Trades: Half-gnomes treat all skills as class skills, but may only have a number of skill ranks equal to half their Hit Dice in any skill. This ability replaces the class skill list of a half-gnome’s classes. A half-gnome with this racial ability does not have the Single-Minded racial ability. Looks are as deceptive as a light-fingered kender.